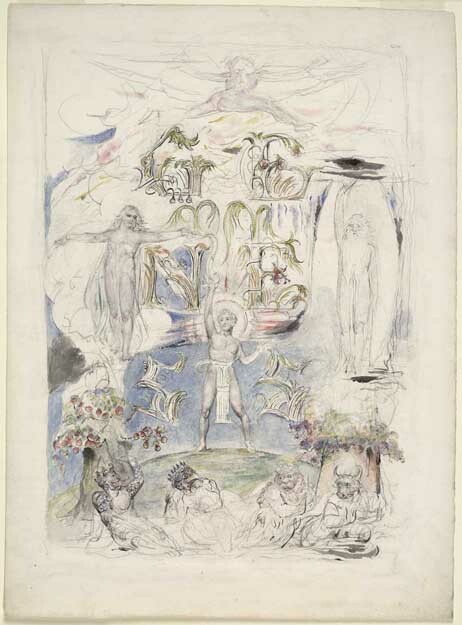 The William Blake Archive is pleased to announce the publication of an electronic edition of the Genesis manuscript from the Huntington Library, Art Collections, and Botanical Gardens. In the last year of his life, Blake began an illuminated manuscript of the biblical Book of Genesis for his patron, John Linnell. Of its eleven large leaves, probably cut from Whatman Imperial-sized wove paper, the first two are title pages. The text on leaves 3-11 closely follows chapters 1-4 of the King James Bible, decorated with sketched headpieces, tailpieces, and interlinear designs, with chapter headings of Blake’s own invention that align the biblical creation narrative with his myth of creation, division, and forgiveness. His insertion of “adamah” after most appearances of “ground” in the English text shows Blake’s (and his patron’s) engagement with the original Hebrew, underscores Blake’s view that the creation of the first man was a descent into materiality, and suggests that Adam was originally androgynous because “adamah” is a feminine noun. Like the title pages of a number of Blake’s early illuminated books, his lettering of the Genesis titles is closely integrated with the illustrations. The reason for variant title pages is not clear, though perhaps Linnell responded unfavorably to the first version (our object 1) and requested the more elegant second version. The main text was composed in six stages, beginning with horizontal lines to guide the lettering. Then Blake drafted the biblical text in light pencil—in a style that mimics the gothic lettering of medieval illuminated manuscripts—and composed the chapter headings. In subsequent stages he overwrote his earlier work in darker pencil, red and green ink, and occasional gold leaf. Thus Blake revised his preliminary intentions with forms evolving on the same matrix. Blake’s use of headpiece and tailpiece pairings to denote chapter divisions conforms to eighteenth-century conventions for illustrated books and follows the format of his early illuminated books, such as The Book of Thel (1789) and Visions of the Daughters of Albion (1793). Taken together, the headpieces and chapter headings provide visual and verbal introductions to each chapter that signal Blake’s reinterpretations of the narrative. 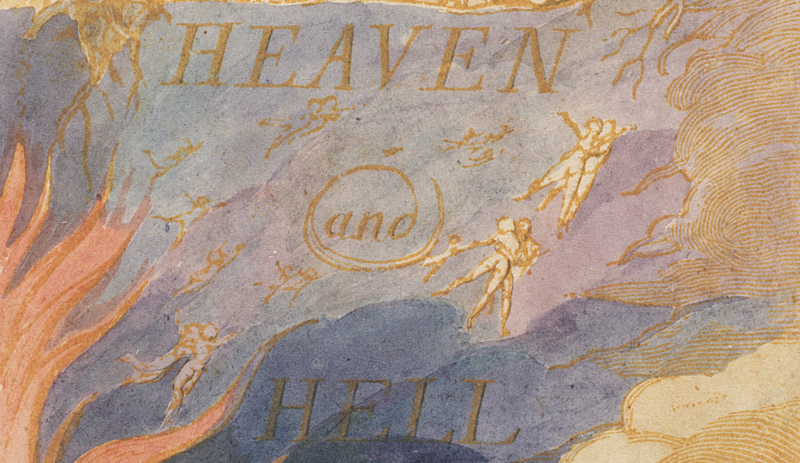 The unfinished state of the Genesis designs offers insights into Blake’s method of graphic composition. There is no obvious sequence to the development of the designs. Those on leaves 3–5 have some coloring, including green, over the initial pencil sketches, suggesting that Blake added washes as he overwrote the penciled text in green. The designs on leaves 6–11 are noticeably rougher and uncolored, like the texts on these leaves. Blake clearly did not finish designs before moving on to start others, probably intending to return later to develop his preliminary drawings. The compositional process was evidently non-linear, spontaneous, and rapid. The manuscript, left unfinished at Blake’s death in August 1827, leaves off with his interpretation of the story of Cain as an exemplary tale of forgiveness, a major theme in his later writings. Pingback: Publication Announcement – Genesis manuscript | Uncategorized | Aggregated blogs on Romantic Studies - please click through to read full posts.